Unintended Pulp Fiction case glow... "Vincent, are we cool?!" Jaguar dash burl headstock face. First of all, I share your utter disappointment in this most suckful photo quality and presentation. It's only a $26K BIN eBay listing, so what the hell, right! Anyway, in 1999, Fender Custom Shop produced 25 Strats for a promotion by Jaguar the car company, who used 20 of them in their dealerships for some kinda customer seduction campaign purposes. I guess 5 were offered to broad public in some way, but I'm not sure if through Guitar Center or what. 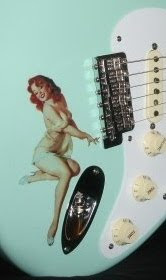 So do your own due diligence research, ok. Those leaping jaguars on the fretboard, made me think that Fender CS could also do a Greyhound bus tribute Strat. Just a fleeting thought though, since nobody gives a f#*k about them. In fact I have bad memories of bus trips. But hey, maybe a Blues theme would still work! The finish is supposed to be Jaguar Green. Then you have the walnut burl thing used for pickguard, headstock face and back plate as well. Nice gold trim is incorporated with the walnut stuff. And there's plenty of other gold which appears to be quite intact-- so at least Mr. Expert Photographer here didn't drag it out to Bubba's PBR Tavern every weekend for jam nite/gear gangbang, "lemme try her out Walt!" The Jaguar themed inlays are pretty cool, unless they remind you of greyhounds though. Case candy includes COA, plus a magazine with the whole story, I assume. A white leather soft case fits inside the big hard case, kinda like the Hendrix Monterey config. Seller: chensly0w3a - Oklahoma based. Also listing a vintage '56 Strat. These Oklahoma boys gots money folks. They also took the Sonics from Seattle. All they need down there now are some decent photographers!